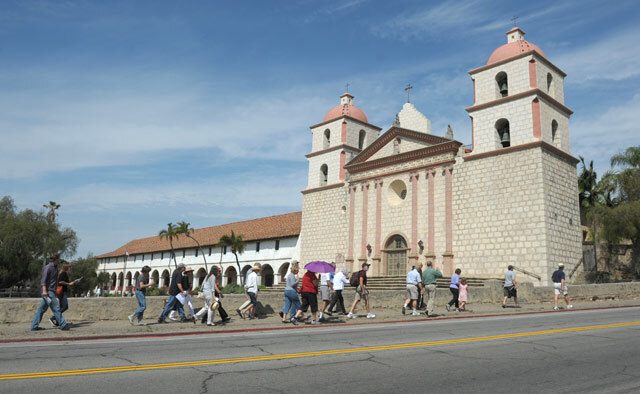 Efforts to create a safer transportation plan for cars, bikes, and pedestrians through Mission Canyon — linking the Santa Barbara Mission, the Museum of Natural History, and Highway 192 — got a warm but cautious embrace by the City Council Tuesday. Supporters of the plan contend the Mission area is difficult and dangerous to navigate given the area’s pinched and winding roads and intermittent sidewalks. An ad hoc coterie of retired planners and architects — with backing from both City Hall and the county supervisors — have proposed a plan to build a continuous sidewalk along the west side of the street and a bike path along the east. To date, there have been two public meetings, but according to some Mission Canyon residents, that wasn’t enough community buy-in. Straightening the road, they charged, would encourage motorists to drive faster, thus putting pedestrians at greater risk. These critics also worried the historic character of the area would be compromised. Other residents strongly supported the proposed changes, leaving the councilmembers struggling to figure out how best to proceed. Preliminary estimates indicate it will cost $2.7 million to install the sidewalks and $631,000 to do the engineering. Presumably, that would be split between City Hall and the county. The council voted 6-to-1 to include the proposed plan on its long list of capital improvement projects. Councilmember Gregg Hart declared Tuesday’s vote “the end of the beginning,” meaning that the details need to be explored more thoroughly. Councilmember Cathy Murillo proposed a third public hearing and won unanimous support.